On October 22, 1956, a group of Hungarian students compiled a list of sixteen points containing key national policy demands. They were read at the foot of the General Bem statue, a Polish hero of the 1848 War of Liberation, in solidarity with the anti-communist demonstrations in Poznan, Poland. We demand the immediate evacuation of all Soviet troops, in conformity with the provisions of the Peace Treaty. We demand the election by secret ballot of all Party members from top to bottom, and of new officers for the lower, middle and upper echelons of the Hungarian Workers Party. These officers shall convene a Party Congress as early as possible in order to elect a Central Committee. A new Government must be constituted under the direction of Imre Nagy: all criminal leaders of the Stalin-Rákosi era must be immediately dismissed. We demand public enquiry into the criminal activities of Mihály Farkas and his accomplices. Mátyás Rákosi, who is the person most responsible for crimes of the recent past as well as for our country’s ruin, must be returned to Hungary for trial before a people’s tribunal. We demand general elections by universal, secret ballot are held throughout the country to elect a new National Assembly, with all political parties participating. We demand that the right of workers to strike be recognised. We demand revision and re-adjustment of Hungarian-Soviet and Hungarian-Yugoslav relations in the fields of politics, economics and cultural affairs, on a basis of complete political and economic equality, and of non-interference in the internal affairs of one by the other. We demand the complete reorganisation of Hungary’s economic life under the direction of specialists. The entire economic system, based on a system of planning, must be re-examined in the light of conditions in Hungary and in the vital interest of the Hungarian people. Our foreign trade agreements and the exact total of reparations that can never be paid must be made public. We demand to be precisely informed of the uranium deposits in our country, on their exploitation and on the concessions to the Russians in this area. We demand that Hungary have the right to sell her uranium freely at world market prices to obtain hard currency. We demand complete revision of the norms operating in industry and an immediate and radical adjustment of salaries in accordance with the just requirements of workers and intellectuals. We demand a minimum living wage for workers. We demand that the system of distribution be organised on a new basis and that agricultural products be utilised in rational manner. We demand equality of treatment for individual farms. We demand reviews by independent tribunals of all political and economic trials as well as the release and rehabilitation of the innocent. We demand the immediate repatriation of prisoners of war (World War II) and of civilian deportees to the Soviet Union, including prisoners sentenced outside Hungary. We demand that the statue of Stalin, symbol of Stalinist tyranny and political oppression, be removed as quickly as possible and be replaced by a monument in memory of the martyred freedom fighters of 1848-49. We demand the replacement of emblems foreign to the Hungarian people by the old Hungarian arms of Kossuth. We demand new uniforms for the Army which conform to our national traditions. 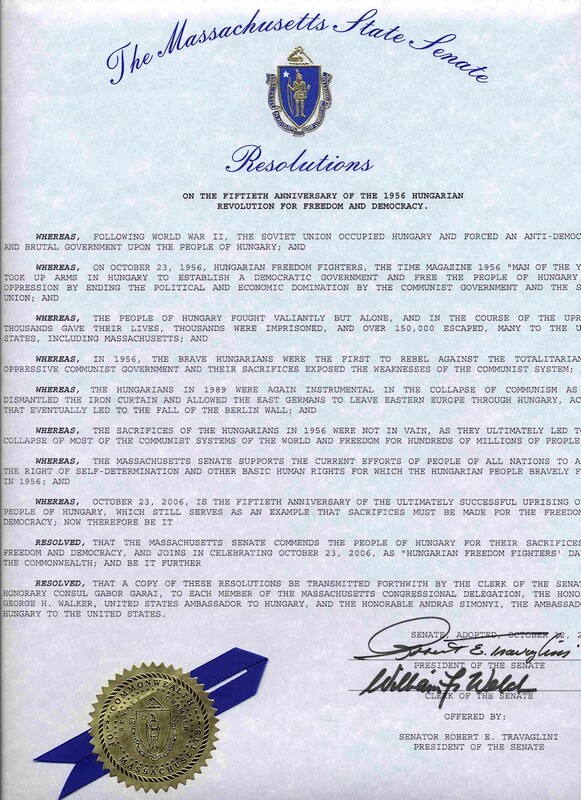 We demand that March 15th be declared a national holiday and that the October 6th be a day of national mourning on which schools will be closed. The students of the Technological University of Budapest declare unanimously their solidarity with the workers and students of Warsaw and Poland in their movement towards national independence. The students of the Technological University of Budapest will organise as rapidly as possible local branches of MEFESZ, and they have decided to convene at Budapest, on Saturday October 27, a Youth Parliament at which all the nation’s youth shall be represented by their delegates. Az 1956-os forradalom 16 pontja az a követeléslista, amelynek első változatát a Szegeden megalakult Magyar Egyetemisták és Főiskolások Szövetsége (MEFESZ) fogalmazta meg 1956. október 20-án, majd a Budapesti Műszaki Egyetemen az ország egyetemeinek küldötteiből alakult diákgyűlés résztvevői öntötték végleges formába október 22-én. A budapesti egyetemisták és főiskolások október 23-i tüntetésének első állomása a belvárosi Petőfi-szobor volt. Itt olvasták fel a 16 pontot, miután Sinkovits Imre elszavalta a Nemzeti Dalt. A műegyetemisták 16 pontja: 1956. október 22. Fenti határozat teljes, betű szerinti közlését ma este a rádió is, a magyar sajtó is visszautasította, a Szabad Ifjúság csak részleges közlését ígérte meg, főleg az első pont miatt. A határozat szövegének stencilen való azonnali sokszorosítását viharosan követeltük, de az arra vonatkozó utasítást Cholnoky rektor nem merte megadni. A nagygyűlés kb. 2000 résztvevőjének spontán felvonulása még ma este folyamán az egyik nyomda elé és a határozat azonnali kinyomtatása - a résztvevők viharos lelkesedése ellenére a megmozdulásnak nem kívánatos eltorzítása, illetve az esetleges összecsapás miatt - elmaradt. Javaslatunkra a határozat végleges szövegét a plénum előtt mikrofonba diktálták, a résztvevők lejegyezték és egyelőre kézi-gépi másolását a főváros széles rétegeiben hólabda-rendszerrel fogják terjeszteni. The 1956 Hungarian Revolution was the first tear in the Iron Curtain. Hungarians from all walks of life rose up against insurmountable odds to fight the brutal Soviet installed Hungarian communist government. Thousands died fighting, others tortured and executed, while 200,000 were forced to flee. 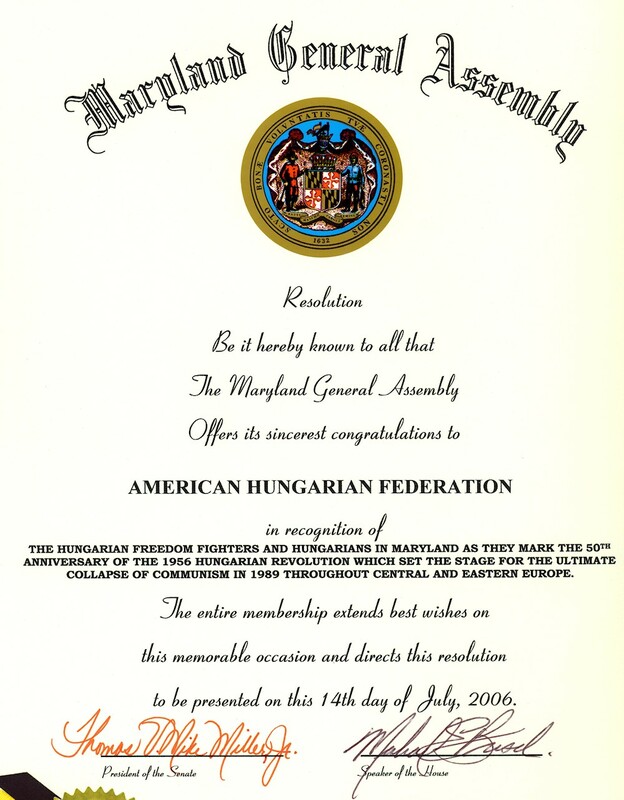 2006 marked the 50th Anniversary of the Hungarian Revolution. AHF's work regarding the tragic events nearly 50 years ago, dates back to the early days of the revolution and thereafter assisting tens of thousands of refugees. In 1956 the American Hungarian Federation activated the second Hungarian Relief program for the refugees of the 1956 Hungarian Revolution, providing $512,560.00. With the support of the American Hungarian Federation, over 65,000 refugees arrived in the USA. Get involved and help us continue our tradition of helping our community! Join Us! 4/28/2006 - Texas became the first state to adopt the AHF 1956 resolution (House Resolution 75). AHF extends sincere thanks to Texas Senator Janek and Representative Woolley for introducing the measure and to AHF's Texas Chapter President Chris Cutrone in Austin and Honorary Consul for Hungary Phillip Aronoff in Houston for their efforts in securing the introuduction of the resolution. 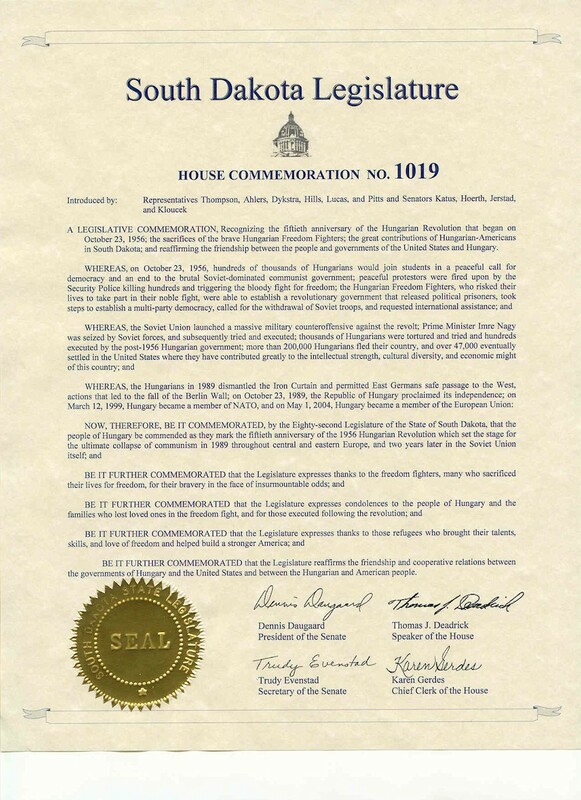 The resolution's title: "Commemorating the 50th anniversary of the Hungarian Revolution and recognizing the sacrifices of Hungarian Freedom Fighters, the contributions of Hungarian Americans, and the friendship between the people and governments of the United States and Hungary." Full text of the Texas resolution can be found on the Texas House Website. The Houston Chronicle also published an Op-Ed calling attention to the resolution by Hungarian Honorary Consul Phillip Aronoff in Houston and Bryan Dawson-Szilagyi, AHF Chairman of the Executive Committee. Special thanks to Laura Spinner for her leadership in getting Gov. Kaine to issue this proclamation! 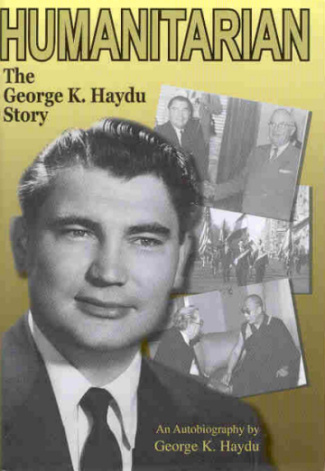 11/15/2005 - AHF President Emeritus, Entrepreneur, Freedom Activist, and 1959 US "Citizen of the Year," George K. Haydu, passed away after long illness. The death of this great humanitarian and leader is a major loss for the Hungarian-American community and to all his many friends. Despite many death threats and being shot in the leg during "Loyalty Day" parade in New York City, George was undeterred in his efforts to bring freedom to Hungary and comfort to refugees. 5/19/2005 - Gergely "Bajusz" Pongratz, a leader and hero of Hungary's anti-communist revolution of 1956, has died at age 73. Pongratz suffered a heart attack on Wednesday in the southern Hungarian town of Kiskunmajsa where he lived, said Dezso Abraham, secretary general of the World Council of Hungarian 56ers revolutionary veterans group. During the revolution, Pongratz was commander of one of the key resistance groups fighting the Soviet army. [read more]. 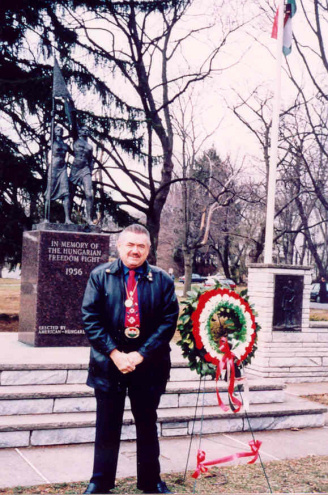 Jeno Andras Szeredas, Hungarian political activist and Senator, 1956 Freedom Fighter, Founder of the Freedom Fighters Federation in the United States, poet and artist of rare talent died quietly in his sleep at his daughter's home in Connecticut on November 30. He had just celebrated his 90th birthday. The 1956 Institute, headed by Dr. Janos Reiner, is a great site devoted to exploring the 1956 Hungarian Revolution in English and Hungarian. 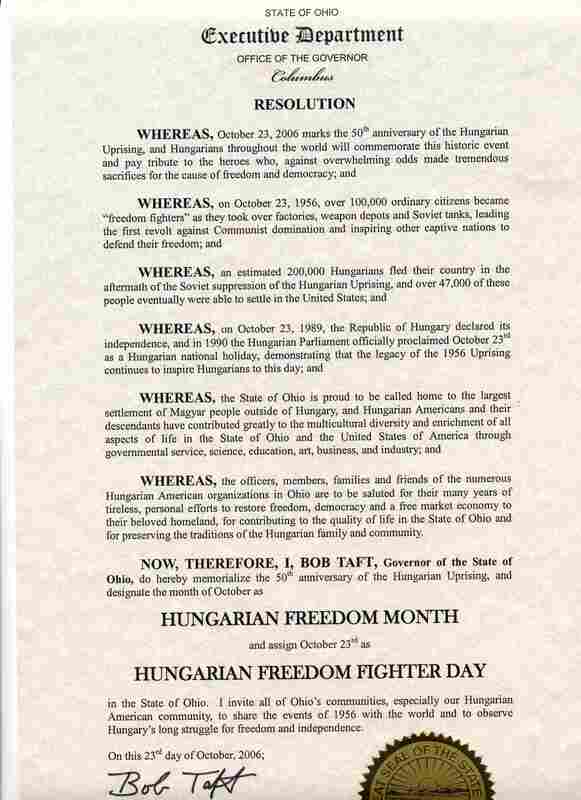 www.celebratingfreedom1956.org - The Cleveland Hungarian Revolution 50th Anniversary Committee (CHR50) is organizing a major observance event of this important historical milestone on October 21st and 22nd, 2006 in Cleveland, Ohio. Magyar Radio Online - includes many audio files and an analysis in Hungarian: "Ki húzta meg a ravaszt eloször 1956. október 23-án?" "Who was the first to pull the trigger?" Time Magazine gave Hungarian Freedom Fighters the title "Man of the Year" on July 1, 1957. "The Freedom Fighters filled the empty bottles with gasoline and corked them with table napkins, making what they called 'benzine flashes." 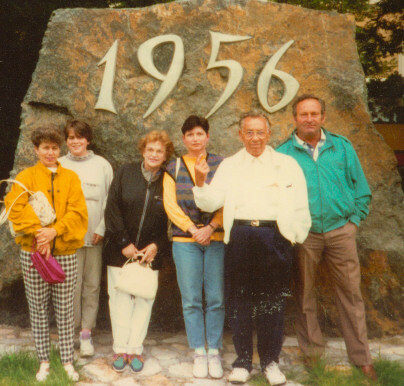 www.FamousHungarians.com - offers information on 1956, the 1956 Olympics, the popular "Nobel Prize Winners and Famous Hungarians," resources on Trianon, Transylvania, History, Music, and more. Wikipedia - the free, online encyclopedia that allows readers to manage its content! The National Security Archive at The George Washington University provides a wealth of information on the 1956 Revolution available for download in PDF. Az 1956-os Magyar Forradalom igaz története - in Hungarian. "What the history books left out." Published by the 1956 World Federation. Nagy Imre október 23-án: Nagy Imre október 23-án eleinte hallani sem akart arról, hogy a Parlamentbe menjen és szóljon a tömeghez. Ám mégis megtette. Döbbenetet érezhetett, amikor lenézett a Parlament ablakából, s akkor is, amikor kifütyülték az „elvtárs” megszólítást. Beszéde az alant álló ismeretlen erovel szembeni aggodalmát és szorongását mutatja. 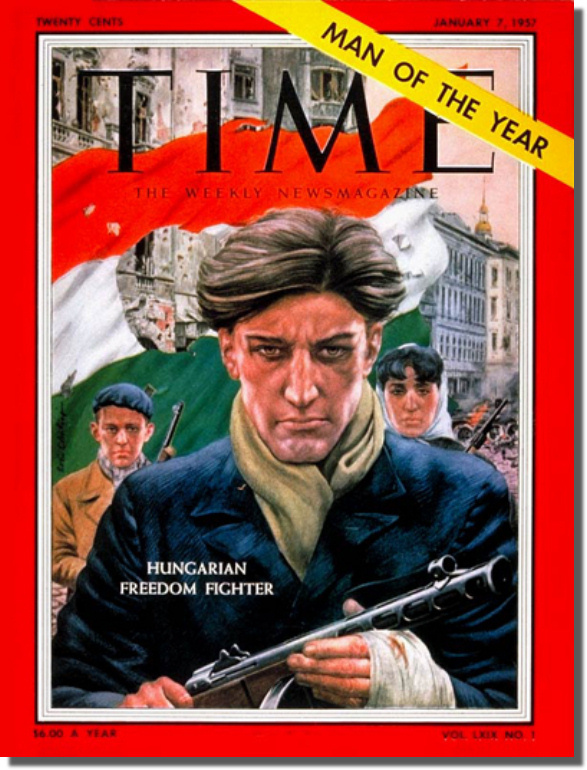 on the first anniversary of the Hungarian Revolution. 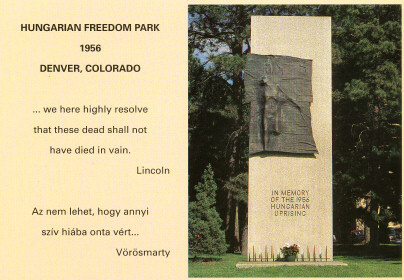 Denver, Colorado - statue and "Hungarian Freedom Park"
"The Blood of the Hungarians"
I am not one of those who wish to see the people of Hungary take up arms again in a rising certain to be crushed, under the eyes of the nations of the world, who would spare them neither applause nor pious tears, but who would go back at one to their slippers by the fireside like a football crowd on a Sunday evening after a cup final. There are already too many dead on the field, and we cannot be generous with any but our own blood. The blood of Hungary has re-emerged too precious to Europe and to freedom for us not to be jealous of it to the last drop. But I am not one of those who think that there can be a compromise, even one made with resignation, even provisional, with a regime of terror which has as much right to call itself socialist as the executioners of the Inquisition had to call themselves Christians. 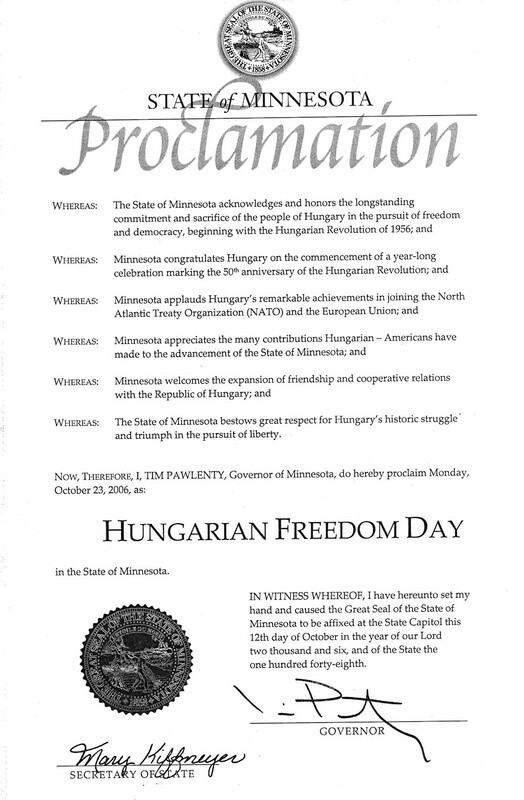 And on this anniversary of liberty, I hope with all my heart that the silent resistance of the people of Hungary will endure, will grow stronger, and, reinforced by all the voices which we can raise on their behalf, will induce unanimous international opinion to boycott their oppressors. And if world opinion is too feeble or egoistical to do justice to a martyred people, and if our voices also are too weak, I hope that Hungary’s resistance will endure until the counter-revolutionary State collapses everywhere in the East under the weight of its lies and contradictions. Hungary conquered and in chains has done more for freedom and justice than any people for twenty years. But for this lesson to get through and convince those in the West who shut their eyes and ears, it was necessary, and it can be no comfort to us, for the people of Hungary to shed so much blood which is already drying in our memories. In Europe’s isolation today, we have only one way of being true to Hungary, and that is never to betray, among ourselves and everywhere, what the Hungarian heroes died for, never to condone, among ourselves and everywhere, even indirectly, those who killed them. It would indeed be difficult for us to be worthy of such sacrifices. But we can try to be so, in uniting Europe at last, in forgetting our quarrels, in correcting our own errors, in increasing our creativeness, and our solidarity. We have faith that there is on the march in the world, parallel with the forces of oppression and death which are darkening our history, a force of conviction and life, an immense movement of emancipation which is culture and which is born of freedom to create and of freedom to work. to the memory of all our comrades who passed during those faithful days of October, 1956.